A little while ago Deborah showed you an A England Camelot manicure with a pretty silver accent nail, which I totally loved. So I thought I would make a manicure that kinda goes with it. This is one coat of Camelot, stamped with Essence Miracle shine and Konad plate m65. 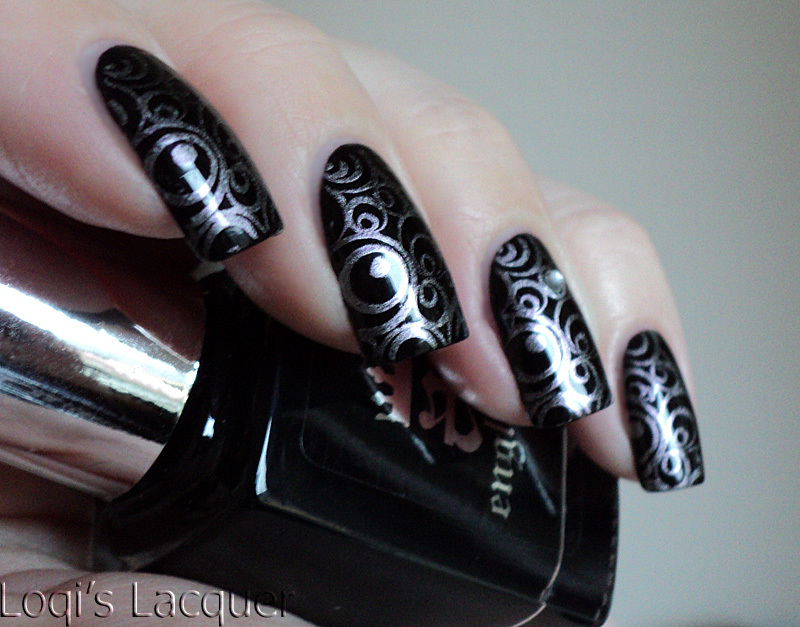 Miracle shine is one of the Essence magnetic polishes and since they are one coaters they make for great stamping. You can even still see a little bit of the violet duochrome it has! So what do you think of this (kinda over the top) manicure? And would you like to see more stamping in the future? Wow, that's a beautiful mani. I love black and silver! Ooooh twinsy manicures <3! I loooove this one, looks perfect! Camelot is great! If you apply it carefully, It's a one coater. Miracle Shine's duochrome reflections do really embellish your final stamped look, more than a simple stamping polish would do. That's gorgeous onto a black or even dark base. And it would be nice to see more stamped manicures..!! ^^ I am glad I could show you something you like! This is stunning! I love it! When looking for stamping polishes, try to go for metallics/magnetics, foils and (other) one coaters. Stamping gives you no chance to build up colour, so you have to use a polish that is very pigmented to get it to show up. Try looking for (essence) magnetic polishes or the Khrome and Romantiqe collections by China glaze, every single polish from these collections work great! 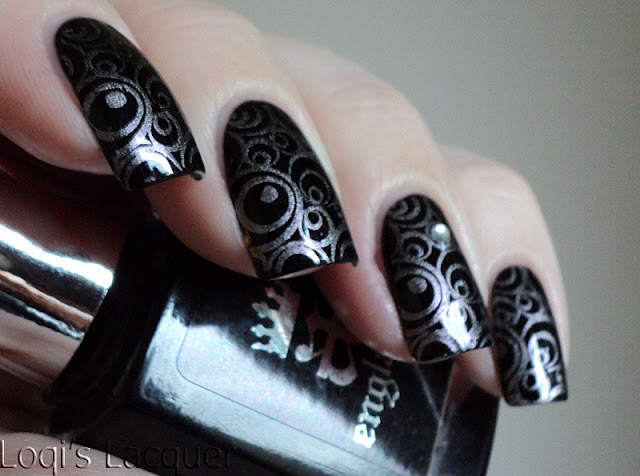 This is an absolutely gorgeous manicure! !